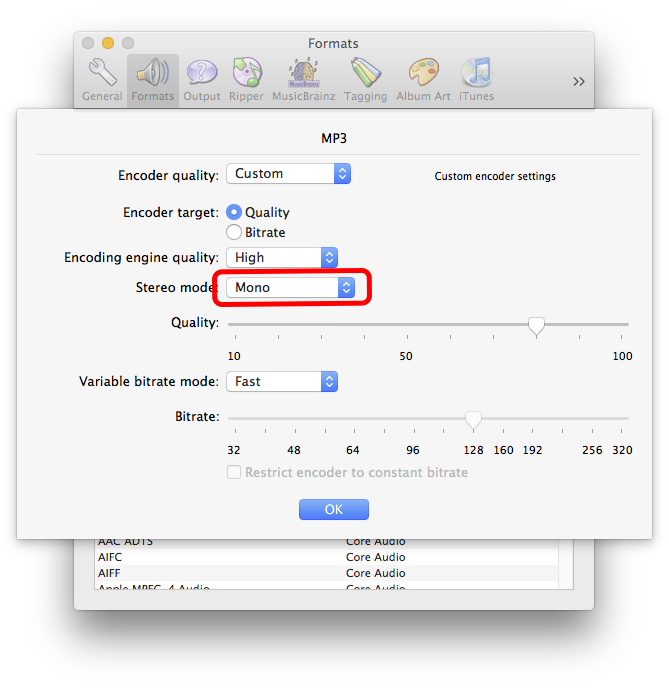 I need an easy way to take a stereo .mov file and convert it to a mono .mp3 or similar formatted audio file. I use Ecamm's Skype Call recorder to record interviews, which I send out for transcription. The call recorder creates an .mov file with 2 channels--one for each side of the call. The transcription software only plays one channel, so the audio sounds like it's one sided. I do this a lot, so I'd like a simple, one-step way to merge the channels and convert the file. Any suggestions? I'd like to use ffmpeg if possible, but a GUI app would be fine as long as it's pretty simple to use. Max (freeware) can drop stereo to mono - though I'm not certain if it will take .mov as input (never tested it). You might need to convert it to a distinct audio format first. Not the answer you're looking for? Browse other questions tagged audio video quicktime mp3 .